Finally nabbed a few minutes in the old craft room!!! I have a very quick and simple card tonight. The challenge this week at Simplicity, is "overlapping". We are to overlap the sentiment and image. Susan doesn't care where on the page we put it, but we need to overlap. I used pink and green Colorbox Chalk inks for the coloring, and actually colored them using a waterbrush. Fun and fast! I am also going to enter this at Creative Card Crew. The challenge there is Pink & Green - I think this might fit! I hope that you and your family are having a wonderful weekend. We are planning to visit the graveyards tomorrow, bearing flags, flowers, and prayers. I will probably see you on Monday! Thanks for stopping by - Hugs to all! I love time in my flower garden more than just about anything that I do. This year, due to some issues here, we were unable to plant anything. It's been so sad, walking outside, and seeing my normally beautiful garden look so bare! DD brought me some hanging baskets for Mother's Day, so I am pampering them like crazy! They are a beautiful shade of purple, and were my inspiration for the colors on this card. This is something that I made for a non-on-line contest. The stamp is an old one, and there is no company name on it...sorry! It's a shadowbox card, so the back is actually the inside of the card. The image was stamped and fussy cut several times, so that the fence and flowers could be extended. I'm not sure if it is visible in the photo, but the face and hands were stamped and cut out of quilting muslin. I found the satin roses at The Red Rooster (you can check them out on Facebook) yesterday, and the Lavendar sprigs at Ivy and Twigs, both local gift shops here in Farmington. Scrapper's Floss is the 'ribbon' used. Thanks for dropping by - hope this little angel brightens your day! It's Wednesday! We are halfway through the week, and here comes a three day weekend! Wahoo! Hope you all have plans that include rest, relaxation, and fun! It is also Flutterby Wednesday! It's been hectic here, so my card today is very quick and simple. The stamps are all Basic Grey. I'm doing a workshop at a LSS next month, using this stamp set, so have been doing a bit of experimenting. As many of the participants are beginners, the projects have to be easy. Pink and green inks are Colorbox chalk, and the blue is Tempting turquoise SU. I also used some Glossy Accents on the flowers and butterflies to give them a bit of texture. Let me know what you think - what else does it need? Food for thought: What do you get from a pamperd cow? Phoenix, Az., and Happy Birthday Stef! Now, onto really important things! The infamous Glitterbabe is having a birthday on Thursday! Look at the birthday present she will be giving someone! Can you say WOWZERS?!?!? Folks, we could have some serious fun with this! Hope on over to Stef's blog, and wish her a Hippy Bathday (oops...)! Back later today with a card...gotta get dear doggie to the groomer's! Oh, the JOY of paper piecing! This has to be one of my favorite techniques! I was at Michelle's blog (if you haven't been there, you need to go - CUTE blog!!!) a little while ago, and she had created an adorable paper pieced card for a Christmas Challenge! How much fun is that?!!!? The Christmas Stampin' All Year Long challenge #51 is to use paper piecing on our project. I used Christmas scraps, and this adorable JOY stamp by Stampendous. The best part about this card is that I have one Christmas card made, and it's only May! It's Friday! Have a great weekend - Patti J. Fast forward a few hours....WHAT DOES SUNSHINE LOOK LIKE??? Sigh.... I'd like the rain a lot better if I were a duck! I have two cards this morning. The first card is for two challenges. The challenge at the Simplicity blog was to make a one-layer card that incorporates a faux embellishment in some way. My main image is the Papertrey Ink's Everyday Button Bits set. I chose to use the hot air balloons. Of course, we couldn't use 'buttons', so I had to stamp some! I found three circle stamps of the right size to make the balloons. The two smaller stamps were from the $1 bin at Michael's, and the largest circle was in a cute little stamp set that my good friend Olga sent me for my birthday last month. The bottom was sponged on, using the edge of a border that I had cut out and didn't need. Coloring is done with Tombow Markers. 2. Cas-Tastic Challenges: Make a one layer card. 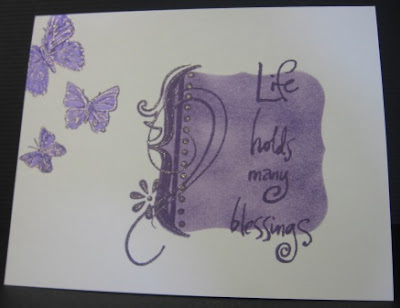 The second card is for the challenge at Stampin' Sisters in Christ. Their challenge this week was to make a card or project that depicts music or singing, or other joyful praise. The sentiment stamp is an Angel Company stamp. The bird is another $1 stamp. The DP is a scrap from my stash...sorry! Coloring is done with colored pencils, and sponging is done with Tim Holtz distress ink, Old Linen. I've added ribbon from my stash, some brown pearls, and a bit of Scrapper's Floss. I hope you are all having a wonderful Thursday. The weekend is almost upon us! It will be a working weekend here! Take care - see you soon! Food for thought: The only time the world beats a path to MY door is when I'm in the bathroom. I am in celebration mode today. Why, you ask? THE SUN IS SHINING!!!!! The birds are chirping. It is NOT raining! It is not even cloudy (yet)! As you can see, this card is NOT a CAS! Ribbon, charm, and roses from my unused and forgotten stash! 1. My Time to Craft: "Under the Weather"
2. Papertake Weekly: "Say it with Flowers"
3. ABC Challenge: "Unused Stash"
4. 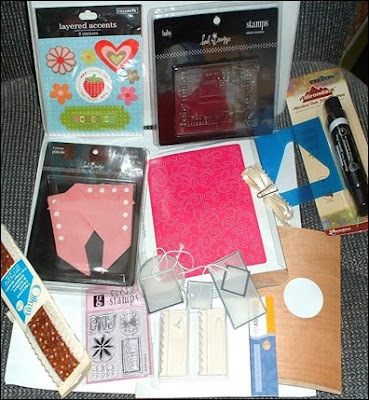 Stamp & Create Challenge #1: "Use ribbon & a stamp that is carried in their store"
5. Flutterby Wednesday: "Use a butterfly, angel, or fairy on project AND flowers"
6. Crafty Ann's Challenge: "Anything Goes"
9. Creative Inspirations Challenge: Cheryl challenged us to use "Punches or Die Cuts"
10. Ooh La La Challenge: "Bright and Cheery"
11. Pollycraft Monday: Joanne challenged us to use "Summer Blooms"
13. Practical Scrappers: "Patterned Paper"
14. A Spoonful of Sugar Challenge: "Cute and Girly"
15. The Cuttlebug Spot: "Favorite Flowers"
Whew...I think this is a record for me! Thanks ladies for helping me understand how to accomplish this! Food for thought: Do Lipton employees take coffee breaks? Here is the card front with all three lockers closed. is mom, dad, and baby's name) Sentiment is The Angel Company. Here is the card front with the third locker open! I just made a photo of the left and right of the tag. This is the photo album. I could not get a good pic of the inside. No matter what I tried, it looked pink. Well, dear friends, there it is, the baseball, basketball, volleyball, soccer ball, locker card! Hope you like it! I pretty much cased this one from Melanie. It's not totally identical to hers, but it is very close. Both Theresa and Melanie's cards can be seen on the Stamp TV site. Just go into the gallery, and type in "Sporty Accessories" in the search box. I'm not at all sure how to link them up on my blog, so I will send you that way! Hope you've had a good day. It's football weather in Mo. Chilly, windy, overcast or rainy, depending on the hour of the day! I survived a trip to Wal-Mart, so I guess all is well! As my DD reminds me, I am certainly happy to be healthy enough, mobile enough, and wealthy enough to be able to go there and shop for 'the finer things in life'. I am, indeed, blessed! Thanks so much for dropping by! Have a great evening - hope to be back tomorrow with a challenge card or two! I told you a few days ago that I'd let you see what I've been working on the last week. I was asked by a friend, to make 40 baby shower invitations, and a card. The new baby's room will be decorated in a sporty theme, and the colors are primarily black and red. I have very few sporty looking stamps, so I was literally THRILLED when I won a challenge at Stamp TV a few weeks ago, and was able to shop for a new set. What better set to choose than Melanie Muenchinger's "Sporty Accessories" - great timing! If you are familiar with this set, the card I'm going to make next, will use the locker theme. I'll share it tomorrow, hopefully! I hope the lady will like them. Off I go to work on her card. Have a great weekend, everyone - thanks for stopping by. See you very soon. Food for thought: I've been told that one should never, under ANY circumstances, take a laxative and a sleeping pill at the same time! As you know, I was without computer for a couple of months, and I could not participate in challenges, etc. Now that I'm back, I'm having a bit of a coordination problem! Many of you work on multiple challenges each week, serve on five or ten design teams, etc. Sometimes, your cards meet 20 or more challenges! I am so, SO impressed! I would really love to know your methods of coordinating it all! Do you know ahead of time each week, exactly what challenges you are going to participate in, or do you spend time on your computers searching for them? Do you have notepads at your computer where you scribble like crazy, or do you have a nice, tidy calendar with things neatly penciled in and/or color coded? Do you do the same challenges all the time, or do you hop around and try new challenges? I am 100 percent NOT being sarcastic or sassy here - I really, truly, would love to know some of your organizational and coordination secrets so that I can tidy up my life (and desk) a little! It will be fun to hear what you all have to say, and I'm sure that others would love some 'tidy-up' advice, as well! I'm excited to hear from you all!!! Thanks! I saw this on a bumper sticker yesterday: I'm so old that when I eat out, they ask me to pay in advance! The challenge this week at For Fun Challenges is (not) to make a project that is anything but a card. Sweet! I needed a 'little something' for someone, and here is the perfect excuse to make it! So I guess I lied! Helen at For Fun Challenges just emailed me and whispered very politely that the challenge was to use a stamp! lol...thank goodness I did indeed use a stamp! Oh, well...I have been away since March 11th, I'm allowed a couple of mistakes! I'm sure I saw that someplace...wonder where??? lol!!! Have a great day, everyone! Thanks for stopping by. Food for thought: Sometimes I wake up grumpy, and sometimes I let him sleep! It was so exciting to wake up this morning, and run to the office to check e-mail on MY computer! I knew that it was Wednesday, and that Susan would be posting a new challenge for this week. UGH... that means a clean and simple one layer card. Have I ever told you how confident I am making one layer cards? lol.... Hellooooooooo...how do you hide an ink smudge without using flowers? Tee hee! WELL...today's challenge by Susan, at Simplicity by Late Blossom, was to make a one layer card. Even so, I got excited! I said to myself, "self, you can do this", (with lots of exclamation points! ), and then I commented on Susan's blog and said "I can do this"!!! So I picked out my ribbon first (notice it has BLING) and THEN made my card. Am I wigged out or what! Anyway, dear friends, I hope you like it! I am SO very excited to be back among the blurfing that I can hardly sit still to blurf! Tomorrow, I hope to be able to show you the baby shower invitations I've been working on, using one of Melanie Muenchinger's wonderful stamp sets. Until then, I'm off to visit your blogs and see what you've been up to! I'm back! I've been doing some visiting tonight, and will catch up with many more of you tomorrow! Hope you are all well, and I can't wait to get back into some challenges! Take care - cya soon! I'm getting my computer today!!! Let me start by saying hello dear blogging friends!!! My goodness, it's been a while since I was here! Thank you to all who are hanging in with me... more in a minute on that situation! ANYway....now that my heart palpitations have subsided, I'm ready to post my CAS card. I have become totally hooked on a blog called "Simplicity" by Late Blossom. Susan does the most phenomenal one layer work that I have ever seen. And darn, she makes it look SO easy, that I almost find myself believing I can do it! I think I will have to read her blog for about the next 800 years before I can really do what she does! Be sure to drop over and check her blog out - wow! Now for some really exciting news! I have good news and bad news - the good news is that I AM GETTING MY COMPUTER BACK BETWEEN 3 AND 4 P.M. ON FRIDAY!!!!!!! WAHOO!!! The bad news is that we will have out of town company for the weekend, and I may not get to 'surf' until next week... :( I am so excited! I can once again check in on my peeps, leave comments, and join in challenges! Food for thought: I'm retired - (I was tired yesterday, and I'm tired again today)!